The Engagement / Bridal Collection handout is intended to be given to the client after the session is complete. It is both an informative guide and sales tool. You will notice there are 6 fields need to be completed by Session Photographer and explained to the client. The data you need to fill out these fields is found on the first screen of the Session App. 1. Gallery URL – This space will be used to add the suffix of the gallery URL. Please inform the client that this is where they can view their images. 3. Gallery Exp. Date – This date is when the Gallery will expire and be pulled off line. Please inform the Client this is the date the Galley will be unposted. All orders should be placed by this time. 4. Amount – This is the amount of the credit the Client has received in their package. Please inform the client that this amount can be subtracted from any of the prices shown on the card. 5. Credit Exp. Date – This is the date the credit amount expires. Most of the time this date is the same as the Gallery Expiration date. Please inform the client of this. 6. Promo Code – This is the code the client will use in the shopping cart to redeem the credit. Please inform the client of this code. Reviewing the Photo Credit Fields opens the conversation to the promotion found on the Collection Handout. Reviewing the promotions is critical for sales. As the Session Photographer, you will receive 15% commision (after Credit) from any purchases the client and family make. Additionally, you are guaranteed a minimum commission of $50 in the even the client does not purchase anything (or just purchase the bare minimum). Sometimes that happens. However, please be sure review the promotional offers on the Collection Handout… it will dramatically increase the odds of securing a lager sale for EVOKE and yourself. For Engagement Sessions, EVOKE offers an additional 30 minutes of pre-wedding coverage when the Image Files are purchased in addition to any Print Collection. The advantage of the Print Collection is that they contain Signature Prints which include extensive retouching, (not to be confused with photo manipulation “make me skinny”….”change the color of my bouquet”), double ply mountboard, and luster UV coating. The back of the handout shows the suggested print layout. Signature Prints are much nicer than the standard prints and do not cost any addition money. Collection 2 is designed to provide the most value and generates more sales than Collection 1 or 3. 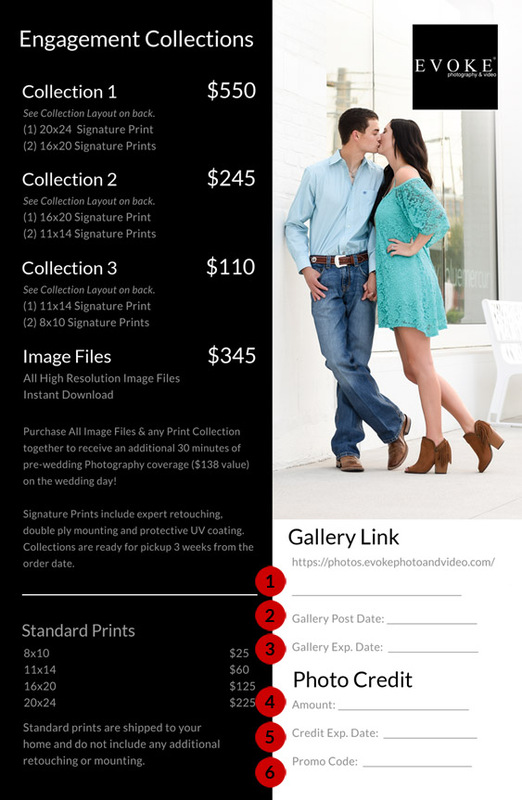 With Collection 2…after the client redeems their $50 photo credit, they receive 1 16×20 Signature Print, 2 11×14 Signature Prints, all the Image Files and an additional 30 minutes of wedding coverage for $540. This generates an $81 commision for you in addition to your $50 shooters fee. Understanding how to explain the offer (and doing an amazing job photographing the session) will dramatically increase the odds of sale. For Bridal Sessions, EVOKE offers 2 $75 (total of $150) of print credit vouchers (redeemable in the Bridal Gallery only) when the client purchase the Image Files. After the client subtracts $50 print credit from the $345 price of the image files, the client receives $150 additional credit and all the Image Files for $295. That’s a good deal. You will receive a $50 commission in addition to your $50 shooters fee…and 15% of all additional sales. Bridal Galleries typically generate more reorders than Engagement Sessions as Moms Grandmas tend to buy prints for their walls, and Brides typically purchase a Bridal display print. It is precisely for that reason that EVOKE issues (2) $75 vouches instead of 1. You will receive 15% of all purchase made above the $150 credit provided for as long as the purchases continue. You are certainly not expect to be pushy when reviewing this information. The focus is on the photography and your relationship with the client! Have fun and do good work. However, mentioning this information at the close of the session will absolutely make you more money.